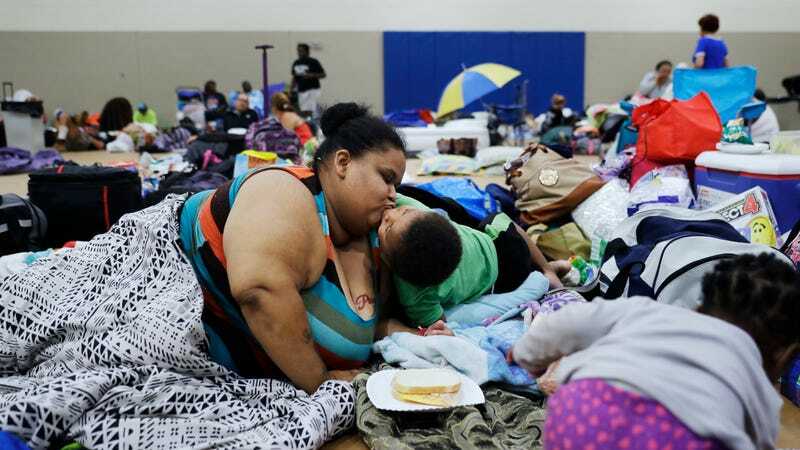 Florida residents hunkering down in Miami in one of the state’s 320 shelters. Image via the AP. 6.3 million Floridians were under mandatory evacuation orders as of this morning in preparation for Hurricane Irma, which Florida governor Rick Scott is calling “a deadly, deadly storm surge.” Irma pummeled the Caribbean late Friday night as a Category 5 storm, claiming the lives of at least 24 people and leaving a scene which the Washington Post describes as “apocalyptic.” It has since been downgraded to a Category 3 but is expected to regain strength as it winds its way up Florida’s west coast as early as Sunday morning. Meteorologists expect flooding of up to 15 feet and Category 4 winds up to 140mph, CNN reports. 25,000 power outages were reported from Florida this morning, and FEMA expects them to last for days. Many assisted-living homes are bracing for senior citizens to stay, CNN reports. NPR has interviewed some of Miami’s 530,000 living below the poverty line, those who lack basic resources like food and water and will not be able to rely on an overburdened government for help. The Miami New Times, which is live-blogging the event, is keeping track of the low-income laborers who are most affected, like fast food workers forced to stay in evacuation zones. Employees whose jobs are being threatened or are not given enough time to evacuate are directed to fill out a survey or drop a voicemail at 407-920-8927 with the nonprofit Central Florida Jobs With Justice. The Naples Daily News also reports that some government employees who choose to leave will risk losing their jobs. Over the past few days, the Pasco county and Flagler county have been using prisoners to fill sandbags. “If you are still in need of sandbags, head to the Bunnell Fire Station and let the inmates do the labor for you,” Sheriff Rick Staly said in a press release. “They will fill the bags and load them into your vehicle.” They are now out of sand. As of this writing on Saturday afternoon, Irma’s winds are just beginning to batter Florida. The Naples sheriff is telling people it’s too late to evacuate, and to head to an emergency shelter. ABC and the Miami National Weather Service are tweeting new shelter locations as they open. UPDATE 4:39pm EST: Speaking of the headline here, Michelle Welk of the St. John Community Center has sent a note reminding us that Irma has already hit United States territory. USA Today has reported that Representative Stacey Plaskett, the Virgin Islands’ delegate to Congress, has called St. Thomas and St. John “devastated,” while the storm has “crippled” the only hospital in St. Thomas. “We are islands. There are not just trucks that can roll in to help us,” she said. Trump approved a disaster declaration for the U.S. Virgin Islands which would hopefully expedite funding, but Welk predicts that, as unincorporated territories, they will be “an afterthought” for federal relief. Welk recommends donating to small 501c3s including the St. John Community Foundation, St. John Rescue, and the Community Foundation of the Virgin Islands. Note that none are rated on Charity Navigator, the first two due to their small size.